When you read the standard macroeconomic textbook you will be introduced to different macroeconomic models and the characteristics of these models are often described as keynesian and classical/monetarist. In the textbook version it is said that keynesians believe that prices and wages are rigid, while monetarist/classical economist believe wages and prices are fully flexible. This really is nonsense – monetarist economists do NOT argue that prices are fully flexible neither did pre-keynesian classical economists. As a result the textbook dictum between different schools is wrong. I would instead argue that the key element in understanding the different “scenarios” we talk about in the textbook is differences in monetary regimes. Hence, in my view there are certain monetary policy rules that would make the world look “keynesian”, while other monetary policy rules would make the world look “classical”. As I have stated earlier – No ‘General Theory’ should ignore the monetary policy rule. The standard example is fixed exchange rates versus floating exchange rates regimes. In a fixed exchange rate regime – with rigid prices and wages – the central bank will use monetary policy to ensure a fixed exchange and hence will not offset any shocks to aggregate demand. As a result a tightening of fiscal policy will cause aggregate demand to drop. This would make the world look “keynesian”. 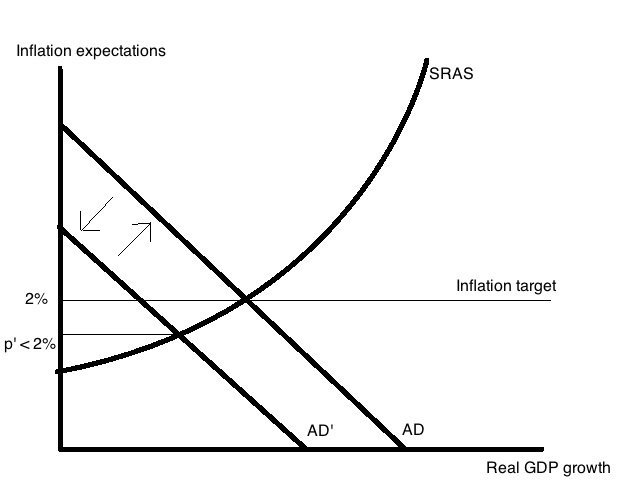 On the other hand under a floating exchange rate regime with for example inflation targeting (or NGDP targeting) a tightening of fiscal policy will initially cause a drop in aggregate demand, which will cause a drop in inflation expectations, but as the central bank is targeting a fixed rate of inflation it will ease monetary policy to offset the fiscal tightening. This mean that the world becomes “classical”. We here see that it is not really about price rigidities, but rather about the monetary regime. This also means that when we discuss fiscal multipliers – whether or not fiscal policy has an impact on aggregate demand – it is crucial to understand what monetary policy rule we have. In this regard it is also very important to understand that the monetary policy rule is not necessarily credible and that markets’ expectations about the monetary policy rule can change over time as a result of the actions and communication of the central and that that will cause the ‘functioning’ the economy to change. Hence, we can imagine that one day the economy is “classical” (and stable) and the next day the economy becomes “keynesian” (and unstable). I fear that what is happening right now in the US economy is that we are moving from a “classical” world – where the Federal Reserve was following a fairly well-defined rule (the Bernanke-Evans rule) and was using a fairly well-defined (though not optimal) monetary policy instrument (money base control) – and to a much less rule based monetary policy regime where first of all the target for monetary policy is changing and equally important that the Fed’s monetary policy instrument is changing. When I listen to Janet Yellen speak it leaves me with the impression of a 1970s style keynesian who strongly believes that inflation is not a monetary phenomena, but rather is a result of a Phillips curve relationship where lower unemployment will cause wage inflation, which in turn will cause price inflation. It is also clear that Yellen is extraordinarily uncomfortable about thinking about monetary policy in terms of money creation (money base control) and only think of monetary policy in terms of controlling the interest rate. And finally Yellen is essentially telling us that she (and the Fed) are better at forecasting than the markets as she continues to downplay in the importance of the fact that inflation expectations have dropped markedly recently. This is very different from the views of Ben Bernanke who at least at the end of his term as Fed chairman left the impression that he was conducting monetary policy within a fairly well-defined framework, which included a clear commitment to offset shocks to aggregate demand. As a result the Bernanke ensured that the US economy – like during the Great Moderation – basically became “classical”. That was best illustrated during the “fiscal cliff”-episode in 2013 where major fiscal tightening did not cause the contraction in the US economy forecasted by keynesians like Paul Krugman. However, as a result of Yellen’s much less rule based approach to monetary policy I am beginning to think that if we where to have a fiscal cliff style event today (it could for example be a Chinese meltdown) then the outcome would be a lot less benign than in 2011. Imagine that the situation in China continues to deteriorate and develop into a significant downturn for the Chinese economy. How should we expect the Yellen-fed to react? First of all a “China shock” would be visible in lower market inflation expectations. However, Yellen would likely ignore that. She has already told us she doesn’t really trust the market to tell us about future inflation. Instead Yellen would focus on the US labour market and since the labour market is a notoriously lagging indicator the labour market would tell her that everything is fine – even after the shock hit. As a result she would likely not move in terms of monetary policy before the shock would show up in the unemployment data. Furthermore, Yellen would also be a lot less willing than Bernanke was to use money base control as the monetary policy instrument and rather use the interest rate as the monetary policy instrument. Given the fact that we are presently basically stuck at the Zero Lower Bound Yellen would likely conclude that she really couldn’t do much about the shock and instead argue that fiscal policy should be use to offset the “China shock”. All this means that we now have introduced a new “rigidity” in the US economy. It is a “rigidity” in the Fed monetary policy rule, which means that monetary policy will not offset negative shocks to US aggregate demand. If the market realizes this – and I believe that is actually what might be happening right now – then the financial markets might not work as the stabilizing factoring in the US economy that it was in 2013 during the fiscal cliff-event and as a result the US economy is becoming more “keynesian” and therefore also a less stable US economy. However, Yellen’s economy is only a 50% keynesian economy. Hence, imagine instead of a negative “China shock” we had a major easing of US fiscal policy, which would cause US aggregate demand to pick up sharply. Once that would cause US unemployment to drop Yellen would move to hike interest rates. Obviously the markets would realize this once the fiscal easing would be announced and as a result the pick up in aggregate demand would be offset by the expected monetary tightening, which would be visible in a stronger dollar, a flattening of the yield curve and a drop in equity prices. In that sense the fiscal multiplier would be zero when fiscal policy is eased, but it would be positive when fiscal policy is tightened. I am concerned that Yellen’s old-school keynesian approach to monetary policy – adaptive expectations, the Phillips curve and reliance of interest rates as a policy instrument – is introducing a lot more instability in the US economy and might move us away from the nominal stability that Bernanke (finally) was able to ensure towards the end of his terms as Fed chairman. Since Mid-2009 US nominal GDP has grown along a nearly straight 4% path (see here). Yellen should make that official policy as this likely also would ensure inflation close to 2% and overall stable demand growth, which would mean that shocks to aggregate demand “automatically” would be offset. It would so to speak make the US economy “classical” and stable. Instead of focusing on labour conditions and a backward-looking Phillips curve Yellen should focus on forward-looking indicators. The best thing would obviously be to look at market indicators for nominal GDP growth, but as we do not have those at least the Fed should focus on market expectations for inflation combined with surveys of future nominal GDP growth. The Fed should completely give up making its own forecasts and particularly the idea that FOMC members are making forecasts for the US economy seems to be counter-productive (today FOMC members make up their minds about what they want to do and then make a forecast to fit that decision). With interest rates essentially stuck at the Zero Lower Bound it becomes impossible to ease monetary policy by using the interest rate “instrument”. In fact interest rates can never really be an “instrument”. It can be a way of communicating, but the actual monetary policy instrument will alway be the money base, which is under the full control of the Federal Reserve. It is about time that the Fed stop talking about money base control in discretionary terms (as QE1, QE2 etc.) and instead start to talk about setting a target for money base growth to hit the ultimate target of monetary policy (4% NGDP level targeting) and let interest rates be fully market determined. I am not optimistic that the Fed is likely to move in this direction anytime soon and rather I fear that monetary policy is set to become even more discretionary and that the downside risks to the US economy has increased as Yellen’s communication is making it less likely that the markets will trust her to offset negative shocks to the US economy. The Keynesians got what they asked for – a keynesian economy. PS I have earlier had a similar discussion regarding the euro zone. See here. That post was very much inspired by Brad Delong and Larry Summers’ paper Fiscal Policy in a Depressed Economy. PPS I would also blame Stanley Fischer – who I regret to say thought would make a good Fed chairman – for a lot of what is happening right now. While Stanley Fischer was the governor of the Bank of Israel he was essentially a NGDP targeting central banker, but now he seems preoccupied with “macroprudential” analysis, which is causing him to advocate monetary tightening at a time where the US economy does not need it. PPPS I realize that my characterization of Janet Yellen partly is a caricature, but relative to Ben Bernanke and in terms of what this means for market expectations I believe the characterization is fair. Talk of further monetary stimulus from the Bank of Japan helped push the yen to a six-month low and lifted the Nikkei to a six-month high on Tuesday, and the move in Japanese assets may have further to run, analysts say. Is forward guidance important? Yes, it is tremendously important – particularly is you have little credibility about your monetary policy target. The Bank of Japan for 15 years failed to meet any monetary policy target, but since Haruhiko Kuroda became BoJ governor things have changed. His masterful forward guidance has significantly increased monetary policy credibility in Japan. Few in the market place today can doubt that governor Kuroda is committed to meeting his 2% inflation target and that he will do whatever it takes to hit that target. Furthermore, when Kuroda says that he is “ready to adjust monetary policy without hesitation if risks materialize” he is effectively making the the Sumner Critique official policy. Said in another way – governor Kuroda will adjust his asset purchases – if necessary – to offset any other shocks to aggregate demand (or rather money-velocity) for example in response to the planned increase in Japanese sales taxes. As a consequence of Kuroda’s forward guidance market participants know that the BoJ will offset any effect on aggregate demand of the higher sales tax and as a consequence the expected (net) impact of the sales tax increase is zero. This of course is the Sumner Critique – an inflation targeting (or NGDP targeting) central bank will offset fiscal shocks to ensure that the fiscal multiplier is zero. So what is happening is that market participants expect monetary easing in reaction to fiscal tightening – this is now lifting Japanese equity prices and weakening the yen. This will boost private consumption, investment and exports and thereby offset the impact on aggregate demand from the increase in sales taxes. The Bank of Japan likely have to step up its monthly asset purchases to offset the impact of the higher sales taxes as the BoJ’s inflation target is still not fully credible. However, given Mr. Kuroda’s skillful forward guidance the BoJ will have to do a lot less in terms of an actually increase in asset purchases than otherwise would have been the case. That in my view demonstrates the importance of forward guidance. My expectation certainly is that the plan sales tax increase in Japan will once again demonstrate that the fiscal multiplier is zero under credible inflation targeting (also that the Zero Lower Bound!) and there is in my view good reason to think that the Japanese economy will continue to recover in 2014 – to a large extent thanks to governor Kuroda’s skillful forward guidance and his commitment to hitting the BoJ’s inflation target. It is now very clear that what Milton Friedman advocated the Bank of Japan should do back in the mid-1990s – to expand the money base to get Japan out of deflation – is in fact working. Nominal spending growth is accelerating and with it deflation has come to an end and real GDP growth is fairly robust. However, some have been arguing the success of Abenomics will be short-lived and that the planned increases in the Japanese sales tax might send Japan back into recession. In other words Japan is facing a fiscal cliff. In this post I will argue that like in the case of the 2013-US fiscal cliff the fears of the negative impact of fiscal consolidation is overblown and that the risk of recession in Japan is very small if the Bank of Japan keeps doing its job and try to get inflation expectations back to 2%. It is yet another illustration of the Sumner Critique. I think it is pretty easy to illustrate the impact of a sales tax increase in a world with a central bank with a credible inflation target within a simple AS-AD framework. We start out with a Cowen-Tabarrok style AS-AD framework. We use growth rates rather levels and aggregate demand curve is given by the equation of exchange (mv=py). The graph below is our starting point. We have assumed that inflation in the starting point already is at 2%. This obviously is not correct, but it does not fundamentally change the analysis of the “fiscal shock”. Japan’s sales tax will be raised to 8 percent from 5 percent in April and to 10 percent in October 2015, but here we just assume it is one fiscal shock. Again that is not important for the conclusions. A negative fiscal shock in a Cowen-Tabarrok style AS-AD framework is basically a negative shock to money velocity (v), which will push the AD curve to the left as nominal spending drops. However, as it is clear from the graph this will initially push inflation below the Bank of Japan’s 2% inflation target. We are here ignoring headline inflation will increase, but we are here focusing on core inflation as is the BoJ. Core inflation will drop as illustrated in the graph below. If the Bank of Japan is serious about its inflation target it will respond to any demand-driven drop in inflation by counteracting that with an one-to-one increase in the money base to bring back inflation to 2%. The consequence of BoJ’s 2% inflation is hence that there will be full monetary offset of the negative fiscal shock and as a consequence inflation should broadly speaking remain unchanged at 2% and real GDP growth will be unaffected. Hence, under a credible inflation target the fiscal multiplier is zero. As in the case of the US there will be no fiscal cliff. There will be fiscal consolidation but not a negative impact on growth. This of course does not mean that the fiscal shock will not have any impact on the Japanese economy or markets. It very likely will. It is for example clear that if the markets expect the BoJ to step up asset purchases (increase money base growth) in response to fiscal tightening then that would likely weaken the yen further. Something Japanese exporters likely will be happy about. As a consequence the sales tax hikes will likely change the composition of growth in Japan. Finally, it should be noted that everybody in Japan is fully aware of the miserable state of public finances and as a result it is hardly a surprise to Japanese households that the government sooner or later would have to do something to improve public finances. In fact the sales tax hike was announced long ago. Therefore, we should expect some Ricardian equivalence effects to come into play here – an increase net government saving is likely to reduce net private savings. So even with no monetary offset there is likely to be some Ricardian offset. That in my view, however, is significantly less important than the monetary policy offset. How aggressive will the BoJ have to be to offset the fiscal shock? A crucial question of course will be how much additional monetary easing is needed to offset the fiscal shock. Here the credibility of the BoJ’s inflation comes into play. If the BoJ’s inflation target was 100% credible we could actually argue that the BoJ would not have to increase the money base at all. The Chuck Norris effect would take care of everything. Hence, if everybody knows that the BoJ always will ensure that inflation (and inflation expectations) is at 2% then when a fiscal shock is announced the markets will realize that that means that the BoJ will ease monetary policy. Easier monetary policy will push up stock prices and weaken the yen. That will in itself stimulate aggregate demand. In fact stock prices will continue to rise and the yen will continue to weaken until the markets are “satisfied” that inflation expectations remain at 2%. In fact this might exactly be what is happening. The yen has generally continued to weaken and the Japanese stock markets have been holding up quite well even through the latest round of turmoil – Fed tapering fears, Syria, Emerging Markets worries etc. But obviously, the BoJ’s inflation target is not entirely credible and inflation expectations are still well-below 2% so my guess would be that the BoJ might have to step up quantitative easing, but it is certainly not given. In fact the Japanese recovery is showing no signs of slowing down and inflation – both headline and core – continues to inch up. Hence, I am not really worried about the planned sales tax hikes. I don’t like taxes, but I don’t think a sales tax hike will kill the Japanese recovery. In fact I believe that the sales tax hikes are a golden opportunity for the Bank of Japan to once and for all to demonstrate that it is serious about its 2% inflation. If the BoJ copied this note/statement then it basically would be an open-ended commitment to offset any fiscal shock to aggregate demand – and hence to inflation – whether positive or negative. By telling the market this the Bank of Japan would do a lot to reduce the worries among some market participants that the BoJ might not be serious about ensuring that its 2% inflation target will be fulfilled even if fiscal policy is tightened. So far BoJ governor Kuroda has done a good job in managing expectations and so far all indications are that his policies are working – deflation seems to have been defeated and growth is picking up. If Kuroda keeps his commitment to the 2% inflation target and stick to his rule-based monetary policy and strengthens his communication policies further by stressing the relationship between monetary policy and fiscal policy – RBNZ style – then there is a good chance that the planed sales tax hikes will not be a fiscal cliff. U.S. Treasurys prices eased for a second day after jobless claims data suggested solid improvement in the labor market, while stocks’ gains undermined the appeal of lower-risk government debt. The Treasury Department auctioned $13 billion of reopened 30-year bonds on Thursday at a high yield of 3.248 percent. The bid-to-cover ratio, an indicator of demand, was 2.43, the lowest level since August. In the when-issued market, considered a proxy for where the bonds will price at auction, 30-year bonds were yielding about 3.24 percent. The auction followed solid demand in the sales of $21 billion of reopened 10-year notes on Wednesday and $32 billion of three-year notes on Tuesday. US bond yields continue to inch higher. To me that is the ultimate sign that easier monetary conditions is pushing up nominal GDP (and very likely also real GDP). But I am afraid that we will soon hear somebody warn us that higher bond yields will kill the recovery. But we of course know that when bond yields and equity prices are rising in parallel then it is normally a very good sign of higher aggregate demand and that is of course exactly what we need. So if we avoid the biggest fallacy in economics and ask why bond yields are rising then we should find a lot of comfort in the fact that US stock prices are rising as well. And finally there is some Keynesians out there that can explain to me why global stock prices continue to inch up, bond yields are rising and the US consumer seems completely unaffected despite of the fiscal cliff (I told you so!) and the sequester. Market Monetarists of course have an answer – it is monetary policy dominance – monetary policy can always offset any impact on aggregate demand from a fiscal shock. It is very simple – and is the positive spin on the Sumner Critique. (Here is a model textbook Keynesian should be able to understand). PS yes you got it right – I am very optimistic both on the markets and on the recovery at least in the US (I have been optimistic for a while – see here and here). My only two fears are that the ECB once again will do something stupid or that we will have a repeat of the mistakes of 19367-37 – premature monetary tightening from the fed. Italian politics is, however, not keeping me awake at night. Investors who fled in fear over potentially massive tax increases associated with the “fiscal cliff” have barely broken a sweat over corresponding spending cuts that are only two weeks away. The so-called sequestration of $110 billion a year in discretionary spending will happen March 1 if Congress does not come to an agreement. With little indication that Washington is anywhere near a compromise similar to the one that avoided the full brunt of the fiscal cliff, markets could be expected to be in full panic mode. But the post-cliff rally has shown no signs of letting up and the topic has gained little traction around Wall Street. It is clear that Jeff never read any Market Monetarist blogs. If he had he would have known that monetary policy always overrules fiscal policy – there is monetary policy dominance and therefore financial markets should not be worried about a sizable fiscal tightening. With the Bernanke-Evans rule the Fed has committed itself to continuing and escalating – if necessary – monetary easing until there is a substantial improvement of US labour market conditions – essentially this is a commitment to increasing aggregate demand. Hence, the Fed is also committed to counteract any negative impact on aggregate demand from a potential tightening of fiscal policy. Even if the fiscal cliff would be a negative shock to private consumption and public spending it is certainly not given that that would lead to a drop in overall aggregate demand. As I have discussed in earlier posts if the central bank targets NGDP or inflation for that matter then the central bank tries to counteract any negative demand shock (for example a fiscal tightening) by a similarly sized monetary expansion. Even if we assume that we are in a textbook style IS/LM world with sticky prices and where the money demand is interest rate sensitive the budget multiplier will be zero if the central bank follows a rule to stabilize aggregate demand/NGDP. As I have shown in an earlier post the LM curve becomes vertical if the monetary policy rule targets a certain level of unemployment or aggregate demand. This is exactly what the Bernanke-Evans rule implies. Effectively that means that if the fiscal cliff were to push up unemployment then the Fed would simply step up quantitative easing to force back down unemployment again. Obviously the Fed’s actual conduct of monetary policy is much less “automatic” and rule-following than I here imply, but it is pretty certain that a 3, 4 or 5% of GDP tightening of fiscal policy in the US would trigger a very strong counter-reaction from the Federal Reserve and I strongly believe that the Fed would be able to counteract any negative shock to aggregate demand by easing monetary policy. This of course is the so-called Sumner Critique. So Jeff the reason the markets are so relaxed about the so-called sequestration might very well be that the Fed has regained some credibility that it actually is controlling aggregate demand/NGDP. I know it is hard to understand that it is not important what is going on in the US Congress, but the markets really don’t care as long as the Fed is doing its job. Following US political debate these days is like following a bad parody of a third world banana republic and even though I the deepest respect for Americans and US in general I must say it is hard not to agree with those Europeans that shake their heads these days and say “they are stupid those Americans”. Well, it is not the Americans – it is their politicians and you could say a similar thing about Europe. The latest banana republic gimmick is the suggestion that the US Treasury should use a legal loophole to print a trillion dollar coin in the event that the US congressional majority – that’s the Republicans – would refuse to increase the so-called debt celling. “It’s easy to make sententious remarks to the effect that we shouldn’t look for gimmicks, we should sit down like serious people and deal with our problems realistically. That may sound reasonable — if you’ve been living in a cave for the past four years.Given the realities of our political situation, and in particular the mixture of ruthlessness and craziness that now characterizes House Republicans, it’s just ridiculous — far more ridiculous than the notion of the coin. Nobel Prize or not Krugman is wrong – as he so often is. First, of all there is no reason to think that the US government would have to default on it’s public debt just because the debt ceiling is not increased. The monthly debt servicing costs in the US is significantly smaller than the US government’s total monthly tax revenues. It might be that the US Treasury would have to stop paying out salaries to US Congressmen and stop buying new military hardware for a while – neither would be a major lose – but the tax revenues would easily cover the debt servicing costs. That of course do not mean that I suggest that the debt ceiling should not be increased – that is US party political shenanigans that I simply don’t even want to comment on. However, it is wrong to suggest that the US government would automatically default if the debt ceiling is not increased. Lars, wouldn’t a 1 trillion dollar coin be monetary easing? So it most be good? What I really want to discuss is the Market Monetarist perspective on this discussion. Yes, Market Monetarists have for the past four years argued that US monetary policy has been overly tight and the reason the US recovery has been so relatively weak is the that Federal Reserve has had too tight monetary policy. That has led Market Monetarists like myself and other to call for monetary easing from the Federal Reserve. However, at the core of Market Monetarist thinking is not the call for monetary easing and no Market Monetarist has ever said that monetary easing is the cure of all evils. Rather at the centre of Market Monetarist thinking is the call for a rule based monetary policy. An easing of monetary policy based on a trillion dollar coin is probably the most discretionary and least rule based monetary (and fiscal) idea anybody have come up with over the past four years. Yes, Market Monetarists are certainly skeptical about central bankers ability to conduct monetary policy in a proper fashion, but that certainly do not mean that we think US politicians and bureaucrats in the US Treasury would do a better job. Far from it! I would even go further – I don’t necessarily think that the US economy needs more quantitative easing IF the Federal Reserve started conducting monetary policy based on a transparent monetary rule like NGDP level targeting. Furthermore, if I would have to chose between an NGDP level target or a massive ramping up of quantitative easing within a discretionary framework then there is no doubt that I would choose the rule based framework. Market Monetarists are not the monetary version of discretionary Krugmanian fiscal policy. Concluding, the trillion dollar coin idea is stupid. It is stupid because it banana republic “economic” policy based on the worst political motives without any foundation in the rule of law and a general rules based framework. The fact is that the US government faces serious fiscal challenges. The US public debt level needs to be reduced and even if the Federal Reserve pushed back NGDP to its pre-crisis trend level I believe there would be a significant need for fiscal consolidation. There is no getting around it – debt ceiling or not, trillion dollar coin or not – fiscal policy will have to be tightened sooner or later. And if you need idea about what to cut I have some ideas about that as well (see here). It is simple mamanomics – you can’t continue spending more money than you have. It might be that certain US policy makers would be happy if their mom raised their weekly allowances, but would they also be happy if their mom prostituted herself to do that? PS there is no party politics in what I am saying – I have the same lack of respect for both main political parties in the US as do most Americans. PPS Scott Sumner and Tyler Cowen also comment on the trillion dollar coin – for some reason the two gentlemen are slightly more diplomatic than I am. Josh Hendrickson, however, is as clear on the issue as I am – Josh has two posts on the trillion dollar coin. See here and here. PPPS If you think there is a lot of James Buchanan and Friedrich Hayek in this post then I have achieved what I want to achieve. After all Friedman and Schwartz’s “Monetary History” is not the only book I read. Update: Both Steve Horwitz and George Selgin comment on the trillion dollar coin – not surprisingly I have no reason to disagree with the two gentlemen. Just take a look at what Google Trends is telling us. The graph below shows searches for “fiscal cliff” over the last 90 days. Since mid-November the searches for “fiscal cliff” has clearly picked up and really spiked in the last couple of weeks. However, despite the desperate efforts of pundits and the financial media the fiscal cliff has never really become a serious market theme. The best way to illustrate this is to look at the US stock market – and more specifically on two sets of stocks – defense stocks and “consumer discretionaries”. Both sectors should be expected to be impacted heavily in the event of a full-blown fiscal cliff event as a result of tax hikes and cuts in US defend spending. I have looked the two sectors’ performance during 2012 relative to the overall stock market performance (S&P500). If the market really had been worried about the fiscal cliff we should have seen defense stocks and consumer discretionaries plummet. However, as the graph below shows that has certainly not been the case. In fact both consumer discretionaries and defence stocks have outperformed the overall US stock market since August-September. Therefore if anything the performance of these two sub-indices have been positively correlated with the fiscal cliff “worries”. In fact I would argue that the markets have paid little substantial attention to the ongoing political noise from Washington. It is for example notable that defence stocks have continued to do well despite Obama’s reelection. This of course do not prove that fiscal policy is not important – far from it, but other things are certainly much more important and the markets are a lot more forward-looking than it seems to be the “normal” perception in the financial media. The discussion of the fiscal cliff has not been (a market moving) surprise to the markets and neither has been the political “show” that we have seen in recent weeks. Yes, the US political system is dysfunctional, but that is really no surprise to the markets. Nor is it likely to be a surprise to US corporations and consumers. As consequence it hard to believe that the fiscal cliff can be classified as an “shock” to the economic system. As my good friend professor Peter Kurrild-Klitgaard has noted the negotiations about the fiscal cliff has been a complete textbook example of a take-it-or-leave-it game. Even though pundits on the left and the right of US politics have bashed both the GOP and the Democrats for failing in the negotiations there is really nothing surprising about how the negotiations have played out. Any student of game theory would tell you that and apparently the markets understand game theory better than pundits and the financial media reporters. There is no reason to play the blame game here – both the GOP and the Democrats (including the President) have so far pretty much behaved rationally (in a game theoretical sense) – that of course do not mean that what they are doing is nice to look at or for that matter in the interest of the American people, but game theorists would not be surprised – neither has the markets been. For good discussion of the game theoretical aspects of the fiscal cliff negotiation see this excellent post by John Patty on the “The Math of Politics” blog from December 14 2012. Finally let me just repeat the Market Monetarist position (see more previous posts on the issue here, here, here and here). Monetary policy dominates fiscal policy – the Fed will be able to counteract any negative shock to aggregate demand (or nominal GDP). The performance of consumer discretionary stocks pretty well illustrates this. As the market started to price in QE3 in August and later was positively surprised by the implicit announcement of the Bernanke-Evans rule in September consumer discretionaries have rallied. Hence, at least judging from the stock market performance monetary policy has dominated fiscal policy worries. I am not arguing that if the there had not been a “deal” on the fiscal cliff the markets would have not seen a set-back, but I am certainly arguing that this issue has gotten far to much attention compared to have relatively unimportant the issue is. I am normally not making predictions here, but I today predict that “fiscal cliff” searches on Google has already peaked (but no I am not a betting man). From today the fiscal cliff is so much 2012. It is time to focus on something else…also for the financial media. PS fiscal policy always have an impact of income distribution and as far and as I can see this is the real issue in the US, but that does not really make the discussion important from a macroeconomic perspective (unless it has supply side effects). Turn on the TV and watch five minutes of CNBC or Bloomberg TV these days and you get the impression that the world is coming to an end as a result of the fiscal cliff. However, the contrast to this is the development in the US financial markets. Yes, there are some jitters in the markets, but the market developments do not exactly indicate that we falling into the abyss in a couple of days. This is the theme of a new excellent post from JPIrving. JP is right – if the markets really were fearing a collapse in aggregate demand then we would see a collapse in the stock markets and we haven’t seen that. “If we would say that there is a 40% chance of taking on the full fiscal cliff, and that markets are already discounting this, I would say that the full fiscal cliff would not have the sort of disasterous consequences some fear. At least this is what the markets say to me. Let me just say I wholeheartedly agree. PS Some (Johan Weissmann at The Atlantic) tells us to worry about a “Diary cliffs” as well. However, the market is not worried. I tend to believe the market, but Weissmann is right that US politicians behave as small children. Why do some market monetarists advocate fiscal austerity? The short answer is the Market Monetarists do not advocate fiscal austerity. What MM’ers are arguing is that monetary dominates fiscal policy. Hence, IF fiscal policy is tightened then it will not necessarily have an negative impact on aggregate demand – or nominal GDP – if the central bank for examples targets inflation or the nominal GDP level. This is known as the Sumner Critique. The view that monetary policy dominates fiscal policy in the determination of nominal spending in the economy makes Market Monetarists less fearful fiscal austerity than for example keynesians. Furthermore, Market Monetarists are highly skeptical about discretionary policies – both monetary and fiscal – and that leads Market Montarists to advocate rule based fiscal and monetary policy. In addition most of the leader Market Monetarists thinkers are libertarian or conservative and as such highly skeptical about a large public sector and as a result many Market Monetarists therefore would welcome cuts in public spending. That, however, is not at the core of Market Monetarist thinking. Finally for most Market Monetarists fiscal austerity is simply about simple arithmetics – in the long run governments cannot spend more money than they bring in. Therefore, for countries that are unable to access the global capital markets – such as Greece – there is no alternative to austerity. Today is supposed to be the end of the world – at least according to classic Mayan accounts (and Hollywood?). But so far we are still here and there are not really any signs that the world really is coming to an end today. However, judging from media reports the world might be coming to an end at least in economic terms as the feared “fiscal cliff” is drawing closer after U.S. House of Representatives Speaker John Boehner yesterday failed to get support for his so-called “plan B”. The fear is that on January 1 we will get a massive US fiscal tightening unless a compromise to avoid it is reached. However, as I earlier have argued the fiscal cliff might not be as bad as it commonly is said to be. The fact is that no matter what US policy makers will have to tighten fiscal policy in the coming years as the size of the budget deficit clearly is unsustainable. Hence, it is just really a timing issue about when fiscal policy will have to be tightened. Fiscal tightening is unavoidable. Said in another way whether or not there is a compromise made on the fiscal cliff or not – this time around – it will have no impact on the average American’s Permanent Income. Hence, the average American will have to pay for the US budget deficit in some way or another today or tomorrow. There is really no way around it. In his brilliant book “A Theory of the Consumption Function” Milton Friedman distinguished between permanent and transitory changes in income and he argued – contrary to the prevailing Keynesian dogma at the time – that only permanent changes in income would have an impact on private consumption. This also means that if tax payers are given a tax break today, but are told that they will have to pay it all back in the form of higher taxes tomorrow then it will have no impact on private consumption today as the income increase is only transitory and will have no impact on the tax payers’ permanent income. This would obviously also mean that if US tax rates are indeed increased in 2013 and that the revenue is used to reduce the US budget deficit then that will have no negative impact on the US tax payers’ permanent income as higher taxes today basically just mean that taxes will not have to be increased in the future. This result of course is a variation of the so-called Ricardian Equivalence Theorem as formulated by Robert Barro in his classic article “Are government bonds net wealth?” from 1974. Hence, if you believe in the fundamental truth of Friedman’s Permanent Income Hypothesis then you would expect the impact of a tax increase to cut the budget deficit and public debt to be much smaller than what the paleo-Keynesian textbook models would indicate. One can of course debate whether the Permanent Income Hypothesis is correct or not and discuss especially the empirical validity of the Ricardian Equivalence Theorem (RET). Personally I am somewhat skeptical about assuming that RET will always hold. However, on the other hand if the budget deficit is not reduced then sooner or later I certainly would expect some kind of RET style effect to kick in. That would naturally trigger consumers to cut spending on the expectation of higher taxes. The budget deficit will have to be cut – either through higher taxes or lower public spending – whether or not the fiscal cliff (if it happens). I am not arguing that tax increases are good – certainly not. I think higher taxes have significantly negative supply side effects but I am very skeptical about the view that private consumption automatically will drop as much as the increase in taxes and even more skeptical that that would have an impact on aggregate demand (more on that below). This discussion is similar to the discussion in a new paper by Matt Mitchell and Andrea Castillo. In their paper “What went wrong with the Bush tax cuts?” they discuss why the Bush tax cuts failed to spur growth. I must admit I have not fully digested the paper yet (it just came out), but as I read it Mitchell and Castillo argue that the 2001 Bush tax cuts failed to have the intended economic impact primarily for two reasons. First, the tax cuts were announced to be temporary – and hence Milton Friedman would have told you that it would have no impact on permanent income and hence no impact on private consumption. Second, Mitchell and Castillo argue that since the tax cuts were not accompanied by similar budget cuts then consumers and investors would not expect the tax cuts to last – even if politicians had claimed they would. I believe that if one argues that the Bush tax cuts failed to boost private consumption growth because of the reasons discussed above then you would have to think that there will be little impact on private consumption when the tax cuts expire. Again I am not talking about supply side effects, but the expected impact on private consumption and aggregate demand. I am not arguing here that the fiscal cliff would be without problems. While the US certainly needs consolidation of public finances there are likely only small costs of postponing the fiscal adjustment and the uncertainty about the US tax code is certainly not good news from a supply side perspective. 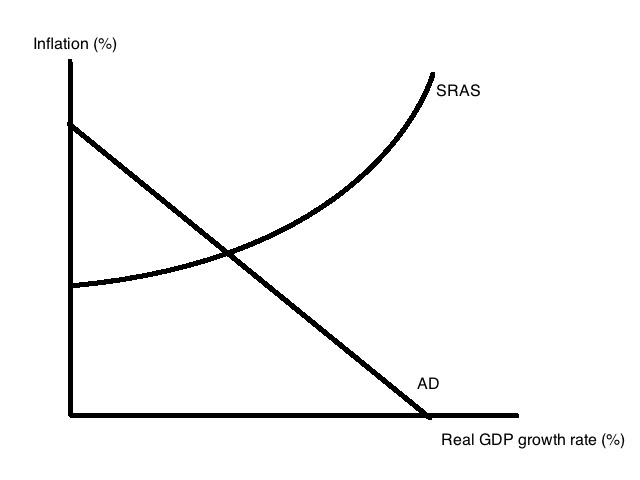 However, from a aggregate demand perspective I think there is much less reason to be worried than debate in the US would indicate. Relax the world is not coming to an end…yet. PS I admit that judging from the market action today we have to conclude that investors are likely not as relaxed about the fiscal cliff as I am. As a faithful Market Monetarist that leaves me with a bit of a dilemma – should I trust my own economic reasoning or should I trust the signals from the markets?